The story begins with a man as handsome as the sun, who loved a woman as alluring as the moon. There was great innocence to their life in the garden – they roamed the fields, laughed with the animals and ate their fill from the bountiful trees. When, one day, along came a slithering serpent, the original salesman, who convinced them to exchange paradise for a shiny apple. Of course, the biblical story of Adam and Eve might already be familiar to you. It is believed that after their departure from the garden, with the passing of time, continents collided and tore apart and that the original Garden of Eden was flung in pieces, far into the ocean. Legend tells of a place poised between heaven and earth, where cool hills stretch their legs and dip their feet in the Atlantic Ocean. Here pristine vines grow and offer up their fruit for the creation of wines that reflect the beauty of Eden, the mystique of a paradise forever lost, and a little bit of the temptation of the serpent… Of course, we’re referring to our spot in the Hemel-en-Aarde Valley – which translates to “Heaven and Earth”. What could possibly be more inspiring than producing world-class wines in a place this special? La Vierge is privately owned and has been producing wines of outstanding quality for more than 10 years. Acting as custodians of this little piece of paradise on the Hemel-en-Aarde Ridge, we’ve produced wines that you won’t taste anywhere else. Back in the day, the very first vines were planted in some of the oldest virgin soil on Babylon Farm. Today 43.5 Ha of the farm is under vine. And we’re tremendously proud of the fact that we produce approximately 100 000 bottles of wine under our own labels. Cool temperatures, high rainfall and cool ocean breezes have allowed us to practice dryland farming… You understood that correctly; no irrigation is used. No irrigation means lower yield. But lower yield, in our case, results in a concentration of really big flavours. This practice not only holds great benefits for our wine production, it’s also an environmentally friendly practice. In a time when the Western Cape is experiencing its worst drought in many years, La Vierge and its employees are proud water warriors. Where does “La Vierge” come from? The name La Vierge is French for “the virgin” and the inspiration for the name came from the unspoiled beauty of our virgin terroir – meaning that never before had vines been planted on this piece of land. We saw its untouched beauty as reminiscent of the beginning of time in the Garden of Eden. And from there the link with Adam, Eve and the apple – they are even reflected in our logo! Together our wines reflect, each with a unique story of their own, how Eve allowed the serpent to seduce her with a, most alluring, forbidden apple. Original Sin Sauvignon Blanc: Some would say we have sinned by planting Sauvignon Blanc, but we know something they don’t. Make sure you try the forbidden fruit of the Hemel-and-Aarde region! Jezebelle Chardonnay: Much like the serpent’s apple, all is not as it seems. Her true nature is an enigma, but the legend lives on in this delightful, bewitching wine. The Last Temptation Riesling: Time moves on, seasons change, but temptation remains. This wine tastes like long hot days, ocean breezes and luscious fruit. Anthelia Shiraz: One sip of this glorious Shiraz and you’ll be in the company of angels. Satyricon Sangiovese: A satirical journey into lust, love and temptation in order to attain knowledge and wisdom… This wine will leave you forever changed. Nymphomane Bordeaux Blend: This wine is inspired by the spiritual beings that appear in the form of beautiful women to embody the creativity of nature. La Vierge Noir Pinot Noir: Inspired by the feminine power of the Black Virgin, we are tremendously proud of our maiden Pinot Noir. Seduction Pinot Noir: You will be powerless against the seduction of this wine’s rich raspberry and cherry flavours with just a hint of spiciness. The Affair Pinot Noir: A complex love affair between the soft, feminine side of Pinot and the spicy, masculine strength of brooding, dark forest floor aromas. 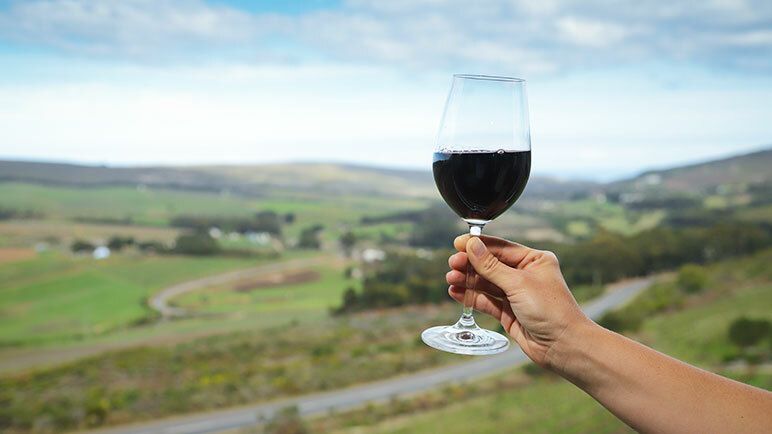 Next time you find yourself in the Overberg, perhaps to come spot a few whales in Hermanus, do yourself a favour and meander up the Valley to our beautiful Tasting Room. Sit back, relax and enjoy delicious wines and when you get hungry, simply migrate towards our restaurant to enjoy a succulent steak, or a variety of other treats, like the “One and Only Onion” (a dish the restaurant has become famous for!). For directions or to get in touch visit our website. We look forward to seeing you at our little spot of paradise!